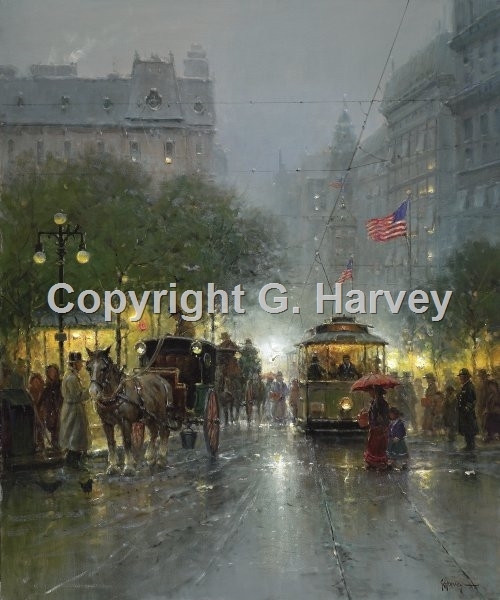 G. Harvey travels to the most beautiful and enchanting cities in the world doing research for his city scenes. He submerges himself (and often his wife) in the mood and excitement of each locale, and often spends time researching old photographs of the spots he contemplates painting. Back home in his studio he compiles his physical research and revisits his personal memories to capture the true essence of the city and the mood of the evening twilight or morning dawn. In this piece, he captures all the timeless excitement and color of busy evening on Broadway, perhaps New York's most entertaining thoroughfare.